I wouldn't normally revisit the same restaurant twice in such a short period, but I was so impressed by the lunch menu and dinner seemed different enough to warrant a return visit. 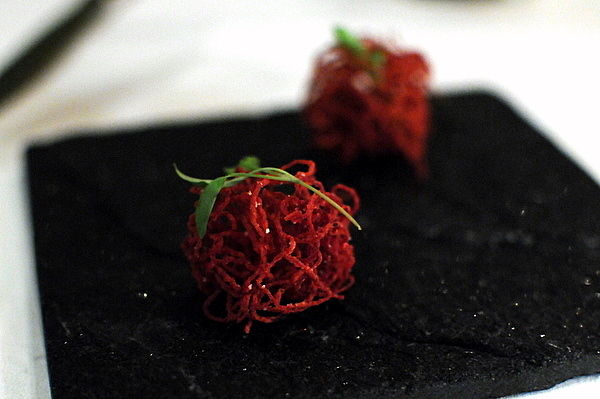 The tasting menu opens with an amuse from the minibar; the strand of beet is deep fried giving it a flavor reminiscent of a sweet potato French fry. Though I typically prefer my oyster and uni minimally adorned, fortunately the course remained unabashedly briney despite the creamy sauce. The application of lime miso was most welcome, a scintillating acidic foil to the heft of the gratin sauce. I could have polished off an even dozen of these and still wanted more. I had a variation of this soup during my previous meal but this time I detected hints of earthy mushroom to go along with the the creamy potage's unctuous liver and savory-sweet corn. 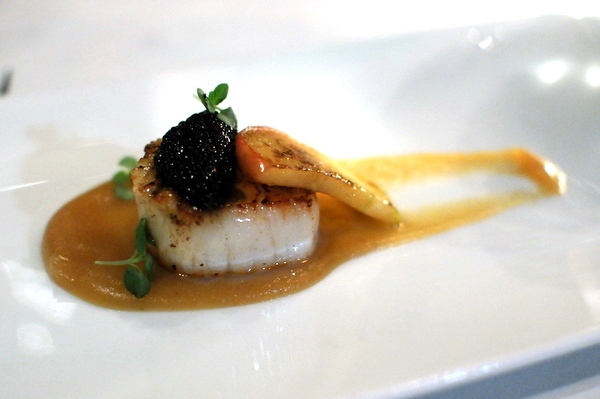 A well-designed course, the disparate flavors of the apple and caviar are neatly tied together by the natural flavor of the scallop. 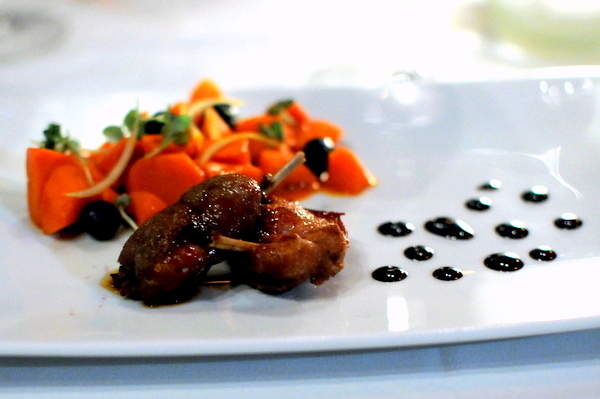 The quail was delectable, the crunchy skin and tender flesh are complimented by a sticky sweet tamarind glaze but the minuscule portion was baffling particularly considering the massive heap of carrots. In fact, the medicinal blend of carrots and lemon zest was so unappealing that I left the serving largely untouched. 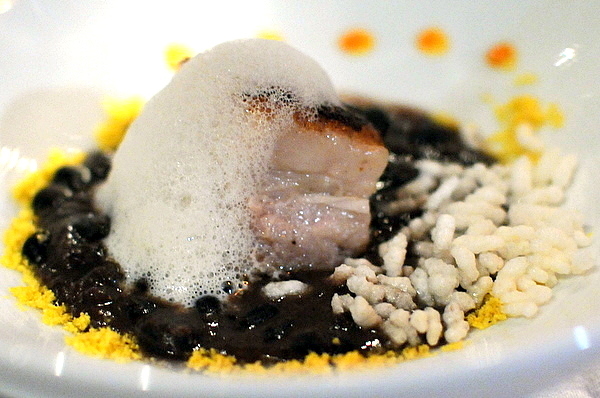 This would have been a superb course had I not had the rice, beans, and a far superior version of pork belly from the restaurant a week earlier. Though equally fatty and decadent, the braised pork lacked the absolutely stellar crispy skin of the earlier preparation. A nice preparation of lamb, the herbaceous tones of the olive, Autumnal sweetness of the zucchini, and the light char of the tomato all compliment the gaminess of the meat making for a very complete well-rounded rustic dish. Ive never been a huge fan of rum cake, too often I think the burn of the alcohol overwhelms the rest of the dessert and that proved to be the case here. By and large the food was solid, there were some hits and some misses, but I left dinner disappointed and not a little hungry. Lunch proved to be superior in every way, better flavors, more inventive, more filling, and cheaper. Stick with the lunch tasting if you want to see what the kitchen can really do. 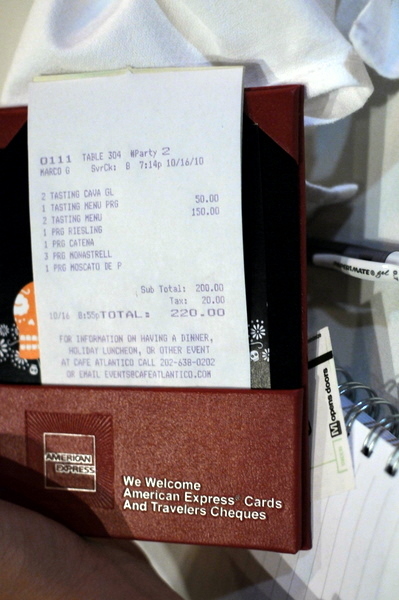 2941 Restaurant is proof that a good restaurant in the most incongruous of places even on the campus of a major defense contractor. The restaurant shares a name with the address of the building where it is located and amazingly the building's only other tenant is General Dynamics who uses the building as their corporate headquarters. 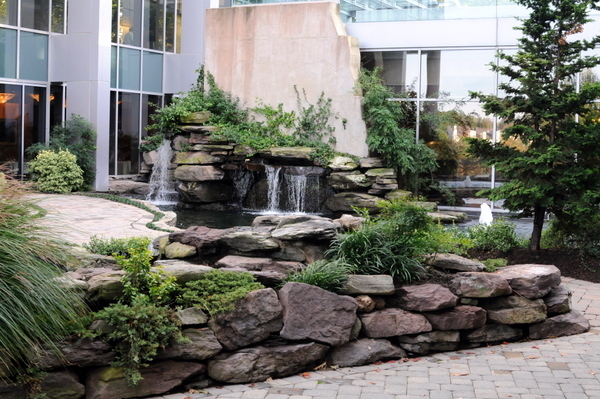 Perhaps my own office gives me low expectations but I was extremely impressed by the well-manicured grounds complete with sculptures, waterfalls, and artificial lakes stocked with Koi. 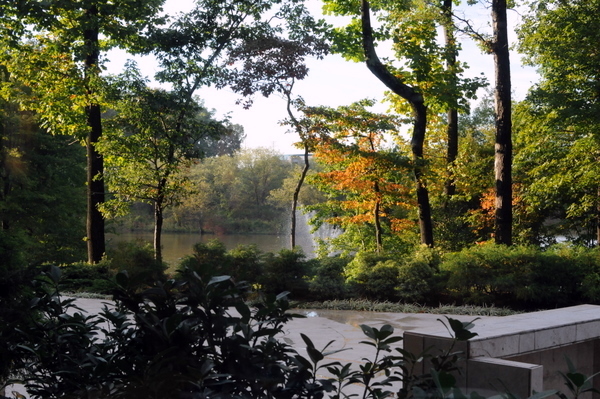 The interior maintains an airy contemporary feel with high ceilings and windowed walls that give an expansive view of the greenery just outside. 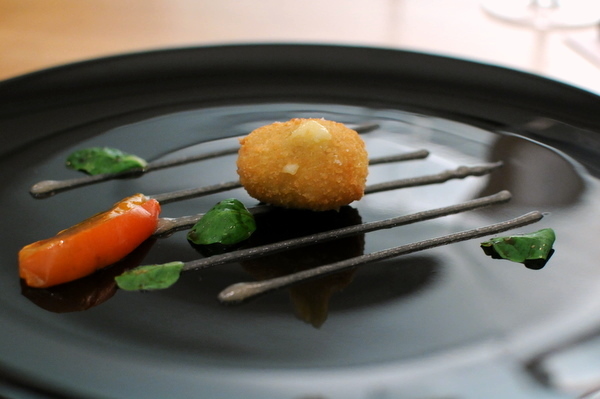 The first canapé was a playful little starter that I'd liken to a chestnut marshmallow with the truffle shavings added a savory fragrance to the creamy-sweet Guimauve. This was my first experience with any form of Marlin sashimi. The fish was denser with a high iron content giving the fish a meatier flavor that paired nicely with the saltiness of the potato and the aromatic black garlic. I wish I had more of this course, the beef was decadently toothsome with the caviar providing a bold salinity that was countervailed by the bright acidity of the clementine. The fried oyster was a simple sapid morsel that lacked the typical brine of a fresh oyster making it more approachable if somewhat boring. The shisito helped matters somewhat giving the dish a slightly smoky edge. Suzuki or Japanese Seabass is something I rarely see outside of a sushi restaurant. 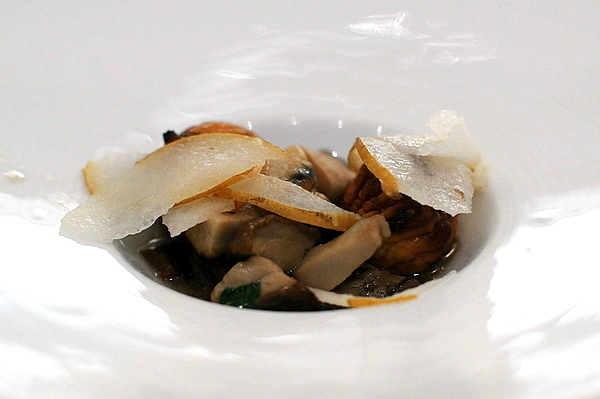 This proved to be my favorite course of the evening, drawing upon a myriad of flavors and textures. The fish itself was lightly seared which was probably all the fish could take before becoming to dry given its low fat content. 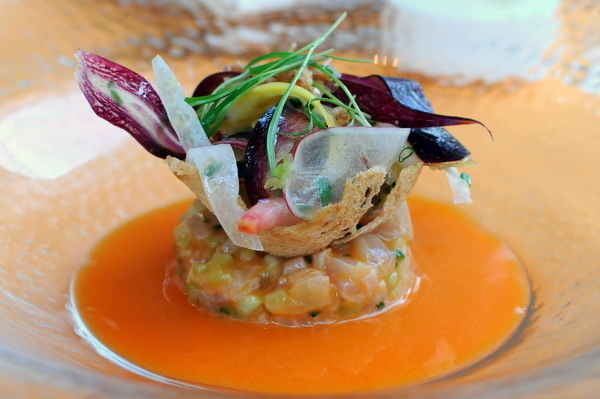 The umami sapor of the fish is complimented by the tanginess of the orange-yuzu absolutely vibrant in conjunction with a sharp spiciness from the chili and the measured sweetness of the beets. 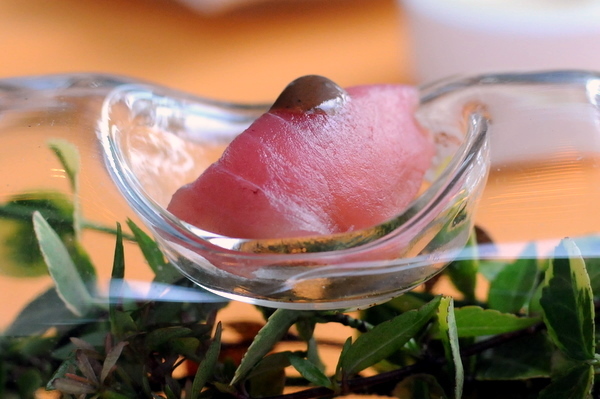 Thanks to Urasawa, Shima Aji has become one of my favorite sushi fishes, even exceeding toro in some cases. Thus I was compelled to order this course despite my worries about the sweetness from the baby carrot and pluot. Sadly my fears were confirmed, but what was worse, the fish was finely diced like a tartare, robbing it of the supple texture that I so treasure. Just catching a wiff of the steam wafting off the surface of the soup and I knew that I was in for a treat. The aroma reminded me of the gao or yellow innards of the crab, unabashedly briney with a slightly bitter metallic undertone. Though I don't normally care for butternut squash, I found the sweetness served as the perfect foil for the soup, balancing some of the harsher flavors of the consommé. 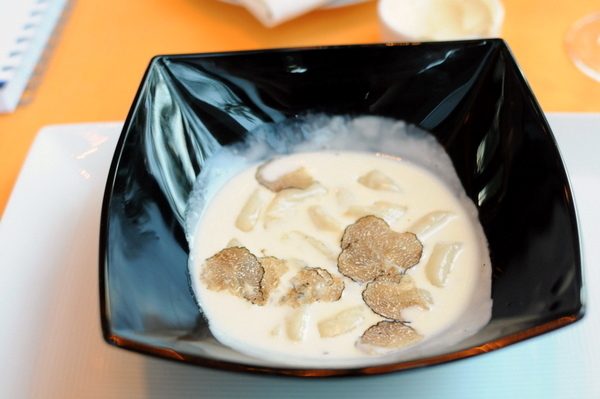 Pasta and truffles were made to be paired, the neutral starch serving as a canvas for the alluring fragrance of the fungi. With such a straightforward dish, there is a fine line between great and merely good and had the gnocchi been the slightest bit firmer it could have been the former rather than the latter. 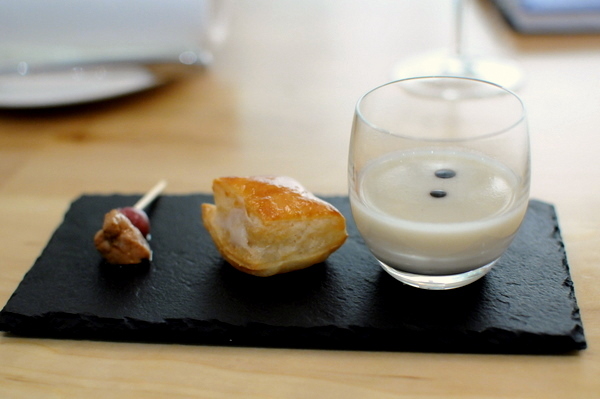 I admired the concept behind this course even though the flavors didn't really work for me. The Marlin was sous vided than finished off on the grill. The slow cooking ensured that the fish wouldn't be too dry, a wise precaution with such a dense meat. 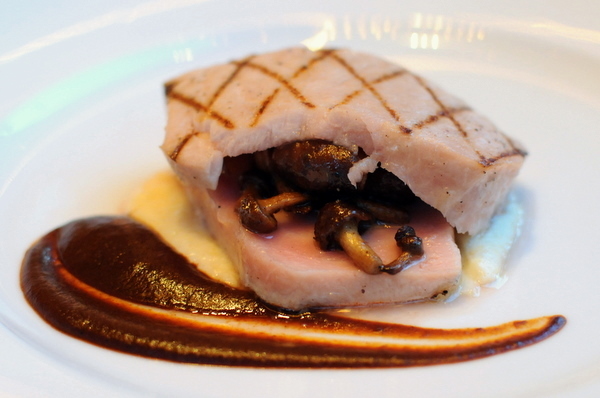 The accompaniments of mushroom and dark smoky mole fit nicely against the hammy savor of the fish. I didn't realize there were brand names when it came to dear meat, but it turns out Cervena is a ranch in New Zealand named for cervidae, the Latin word for dear. Indeed the meat was worthy of the name, succulent and tender with a rustic gaminess, The meat stood on its own though the combination of the porcini, cabbage, and spaetzle worked well with the gamy protein; rustic and dark and just as delicious. A rather heavy palate cleanser, the custard like sorbet came with a mouth tingling cinnamon while the candied quince added a jammy tang on the finish. 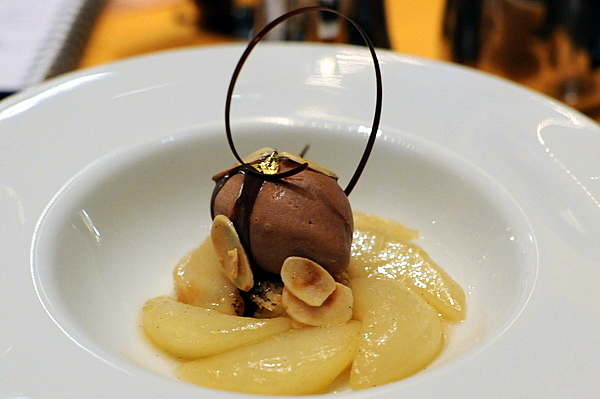 An elegant looking dessert, this combined elements of both fruit and chocolate desserts, with concentrated dark chocolate up front and the delectable ripe sweetness of the pear on the back end. 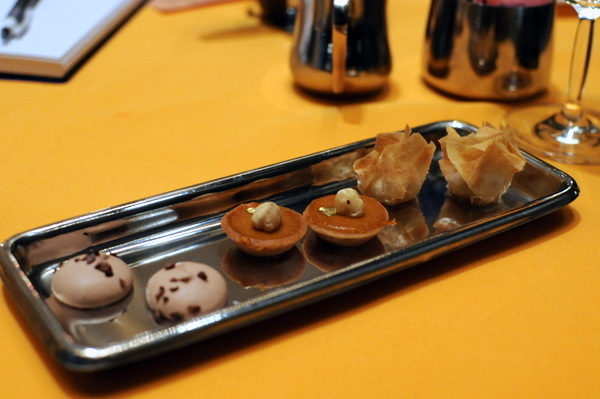 The meal finished with a trio of sweets: chocolate marshmallow, caramel tart, and pear shumai. Considering their ranking at #6 in the Washingtonian top 100 restaurants, I had some high expectations for 2941 and despite some misses, the food held up well. Still something was missing, that indescribable spark that would have set the restaurant apart; though I enjoyed my time, I doubt I'll ever feel the need to return. After a long-delayed renovation the restaurant at the Langham Hotel in Pasadena was ready to open, with a new chef to go along with its new look. I don't think there is any question that Chef Voltaggio made The Dining Room a bastion of progressive cuisine and one of LA's premier restaurants and any successor would have some big shoes to fill. To meet that challenge the Langham's management tapped Chef David Feau who worked closely with Guy Savoy before spending a decade as Executive Chef at Lutèce. 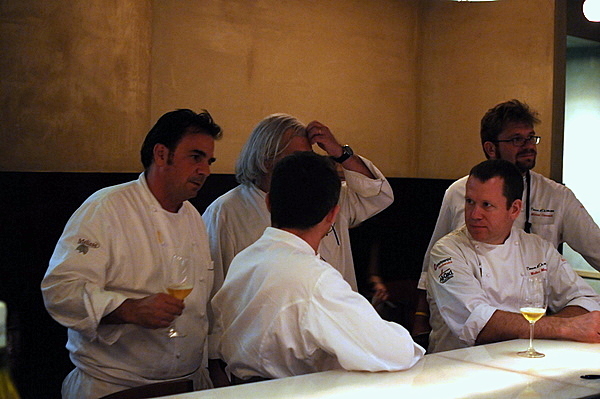 In 2006 he came to Los Angeles to head Café Pinot and eventually rose to Corporate Executive Chef of the Patina Group. 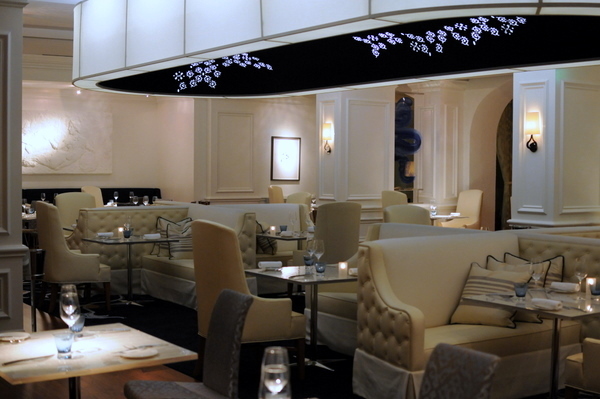 The dining room maintains a sense of luxury befitting the Langham but combines it with a decidedly modern look. 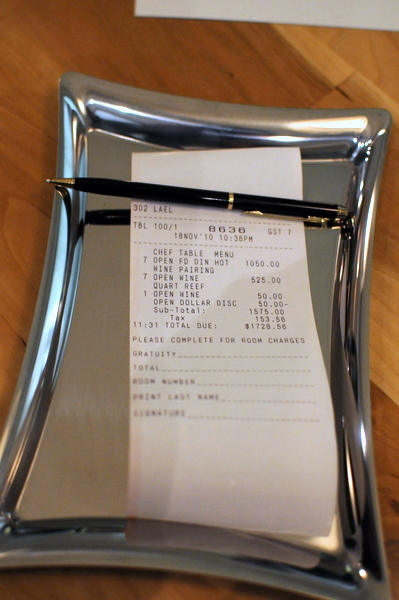 We were seated at the chefs table which is separated from the main dining room by a frosted wall. 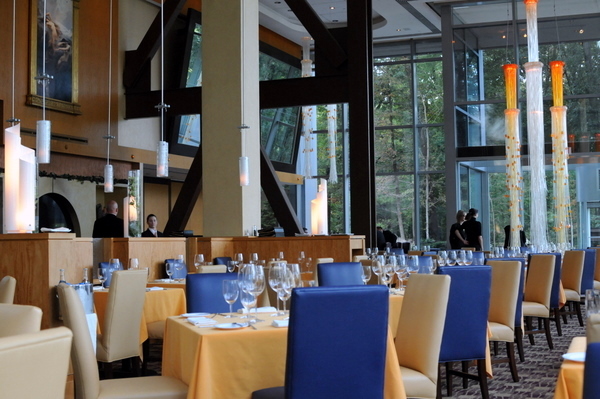 Similarly the kitchen is cut off by a wall of glass leaving the diners with only a vague view of where the magic happens. 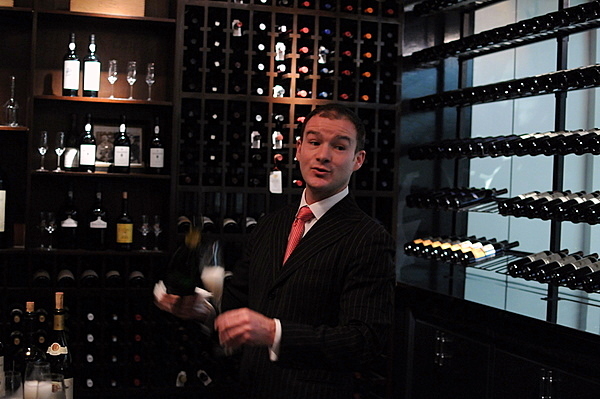 When we arrived, we were greeted by Eric Espuny, formerly of Patina, now Director of Wine at the Royce. He directed us to the red wine room where we held a short reception complete with champagne. 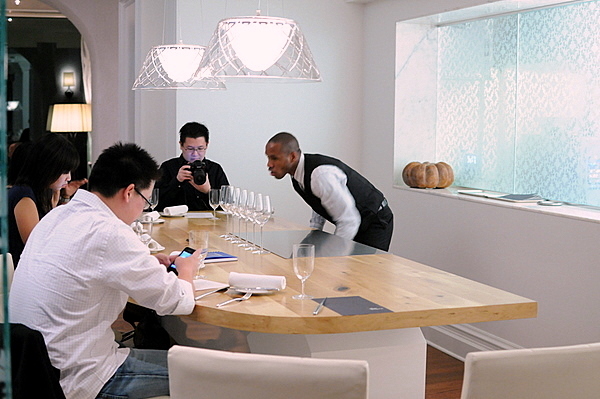 Eric explained to us access to the wine room was restricted to those dining at the chef's table. 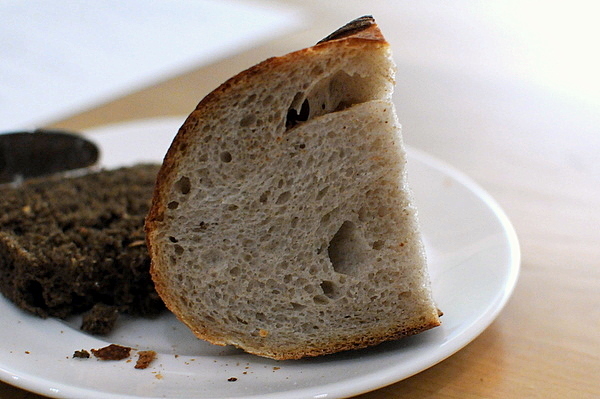 The bread is baked on premises and decidedly heavy and rustic, enjoyable but it would have been better warm. CALF LIVER | PICKLED CONCORD GRAPES - sunchoke soup, cajun spices, smoked herring "friend"
For the Dining Room veterans in our party, the amuse immediately drew comparisons to Voltaggio's, going as far as to use the same dark stone plates. The amuse was decidedly heavy, starting with a sunchoke soop that was remarkably sapid and smoky with a lingering vegetal finish. The puff pastry came filled with an invisible but forceful smoked herring mousse; the characteristic oiliness of the fish contrasting nicely with the buttery dough. Last up was a tiny morsel of calf liver, the potent iron tang of the offal was offset by a burst of acid from the pickled grape. 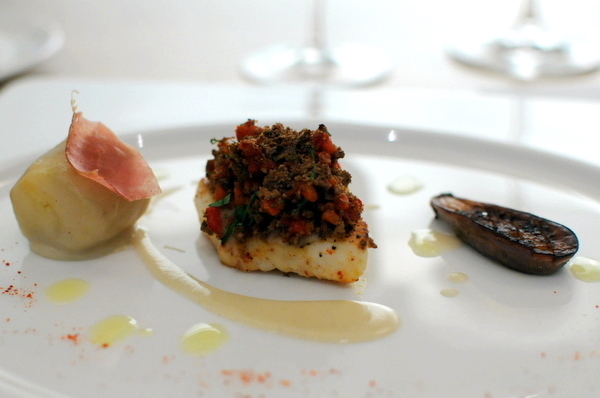 Considering Chef Feau's roots, I expected a more traditional experience at The Royce. Right out of the gate Chef Feau showed us that he isn't afraid to break out the liquid nitrogen when it's called for; in this case to make a vividly pink pomegranate snow that provided a resounding temperature contrast to the dish. 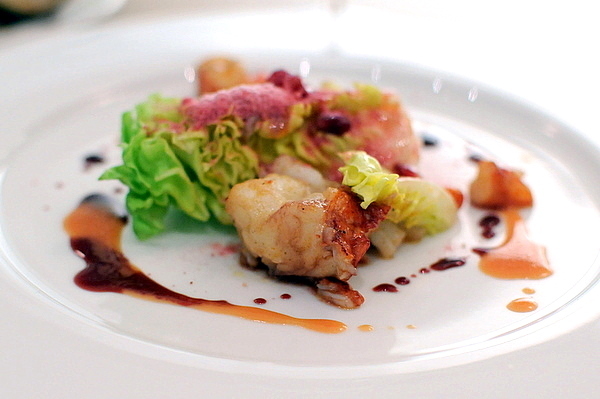 The salad proved to be a super multifaceted affair, the crispness of the lettuce complimenting the tender morsels of lobster whose characteristic flavor was further enhanced by the sweet onion and acidity of the pomegranate seeds. 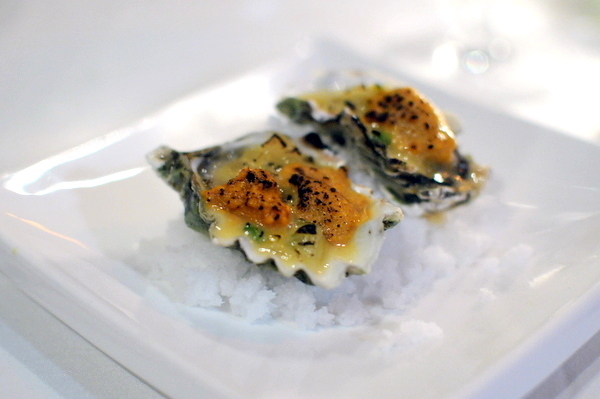 Oysters and caviar is a strong foundation on which to base a dish. Though I prefer raw oysters, the silkiness and concentrated salinity of the cooked Hama Hama was superb. 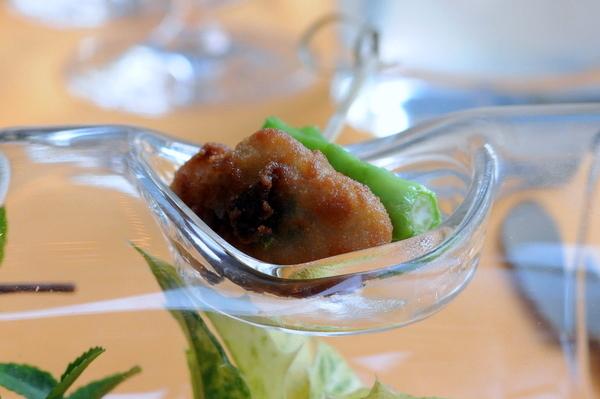 The oyster came wrapped in a verdant lacy gauze of Savoy cabbage. The single leaf of deep green lacked the sulfurous funk of common cabbage and instead provided a sweet foil to the oyster. The wine was a Sauvignon Blanc that exuded a chalky minerality accompanied by a salinity on the palate; the perfect mate to the oyster. Porcini is one of my favorite flavor accompaniment in risotto or other such dish but this was a uniquely memorable experience. the mushroom is a natural companion for the autumnal sweetness of the chestnuts while the pear adds a chill juiciness that balances the earthiness of the casserole. The wine is a fortified Sherry whose woody earth matches the heavy flavors of the porcini and chestnut. Chef Feau was feeling generous, and decided to provide us with an extra course. 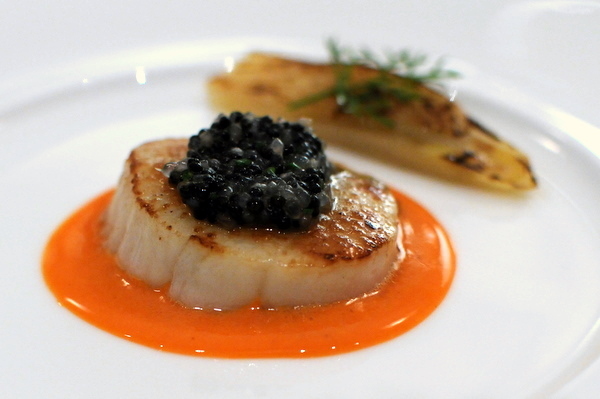 The scallop itself is well cooked and buttery rich with its natural sapor enhanced by a generous spread of caviar. By contrast, the soft endive possesses a lingering bitterness that balances the weight of the bivalve. The crunchy bits of finger lime stood in such stark relief to the ocean born elements, adding a vibrancy of texture and flavor that captivated the entire table. The wine comes from a Domaine Testut in Chablis and carries the characteristic brine and minerality the terroir is known for. Salsify, also known as Oyster Plant for its faint oyster-like flavor has remarkable versatility and this course demonstrates that nicely. 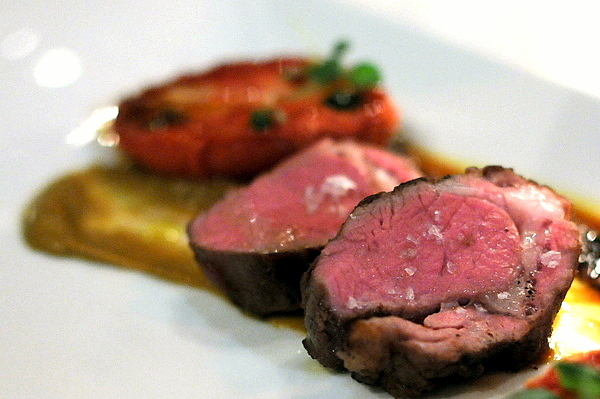 The braised preparation is likely the most natural tasting, savory with a touch of sweetness. 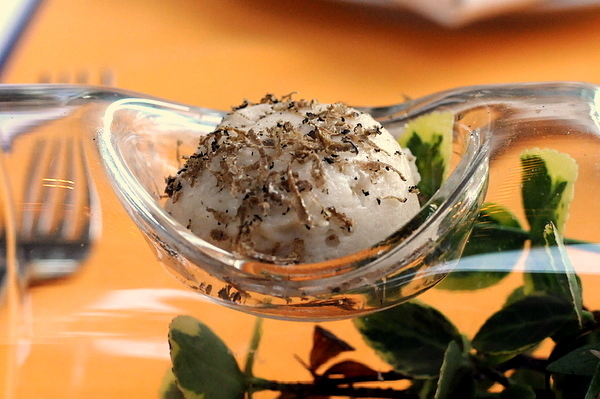 The ash covered preparation retained the sweetness but the prickly coat of ash imparted a charred peppery bite. One of my companions liked the fried version to a sweet potato chip while the puree was exactly like mashed potato and absolutely delicious with the Cajun spice. Paired with this remarkably versatile vegetable is an equally versatile wine, a Chenin Blanc and one of the sweeter wines of the evening with flavors of honeyed stone fruit and almond. 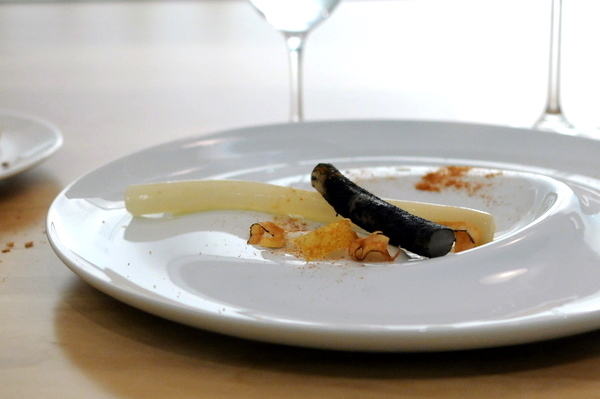 The next course blends elements of French and Spanish cooking from the Basque Country. The fish itself is fairly light and reminiscent of Dungeness crab, sweet with a gentle aroma of the sea. 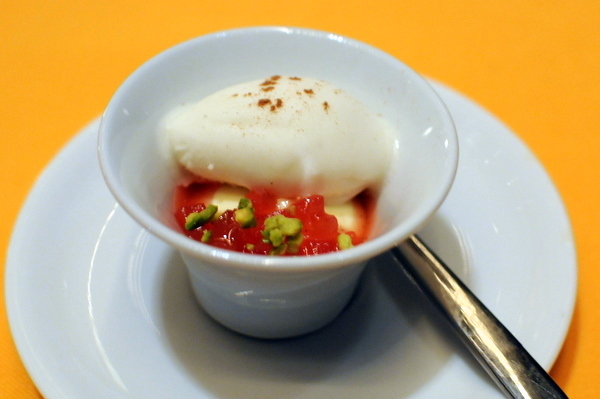 The topping consisted of piquillo peppers which added a rustic vegetal smack to the mix. Fitting that the wine selected to pair with the dish also hails from the Basque region, a bit more rustic than our earlier libations, this wine features notes of honey and apple but also elements of earth and salinity. The chicken itself was taut and lean with very little flavor on its own. 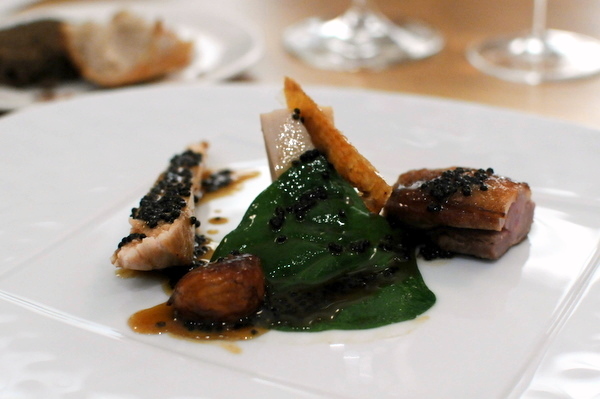 I absolutely adored the use of caviar to flavor the chicken and bringing in a pleasing sensation of the sea to this dish. A Borgeaux blend from Italy the wine centers around a core of ripe sour cherry , but with elements of wood and vanilla giving it some complexity. I've been fortunate to enjoy a pair of stellar venison courses during the past few days, wonderfully tender with a wildness lacking in beef, but yet not overly gamy. 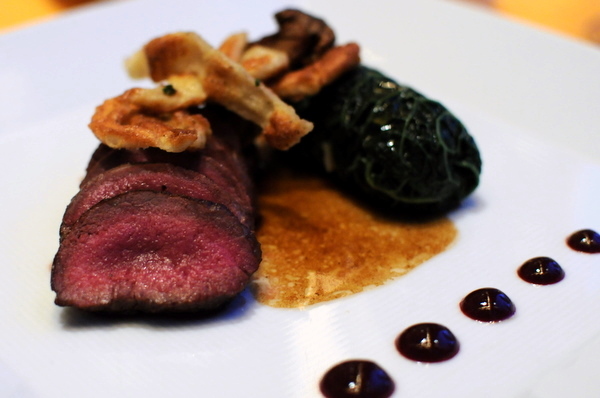 What sets this dish apart from most other venison is the choice of accompaniments. 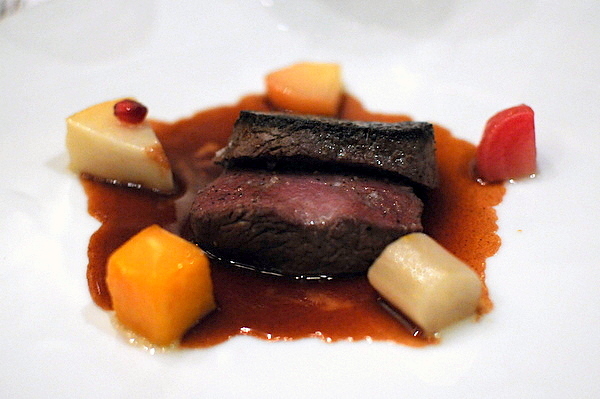 Most preparations pair earthy dark elements drawing on the gamy rustic nature of the deer and in those cases I've found such pairings superfluous, preferring the venison on its own. Chef Feau takes the opposite route, countering the weight of the meat with tropical lychee sweetness and levity from the ginger tinged cabbage. The wine Eric selected for our final savory was a syrah/grenache blend that offers the best of both worlds, bold peppery spice and lush jammy fruits. I love a good cheese cart as much as the next person but some of my most memorable fromage courses have been ones with a single cheese integrated into a unique course. The Jurançon is a full round wine sweet but with enough acidity to keep things lively. 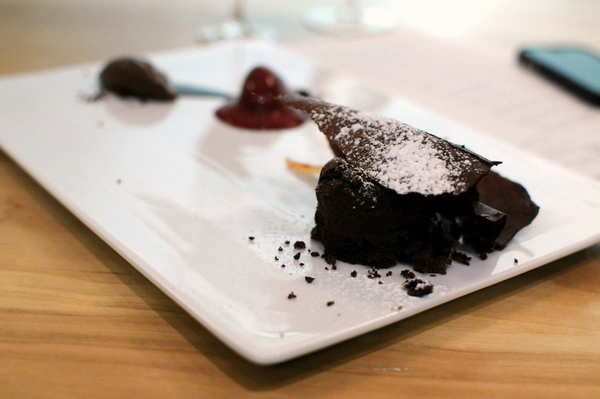 The meal finished with a study in chocolate, the rich flavor of dark chocolate was presented in tuille, souffle, and ice cream form. The black currant sorbet was integral, adding a tart frutiness that kept the dish from becoming too one-dimensional. 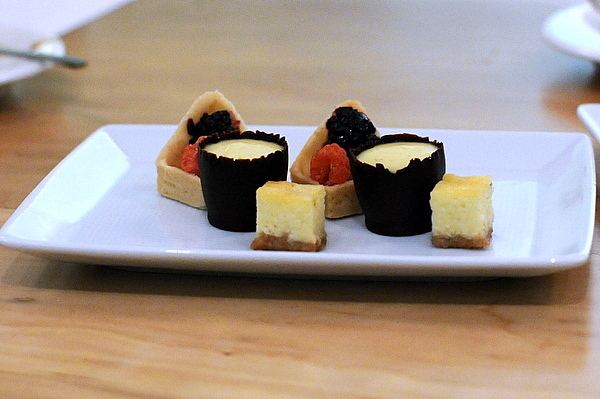 We were brought two plates of mignardises, in the first trio were a queso de torta, a creme brulee with a chocolate shell, and a fruit tart. 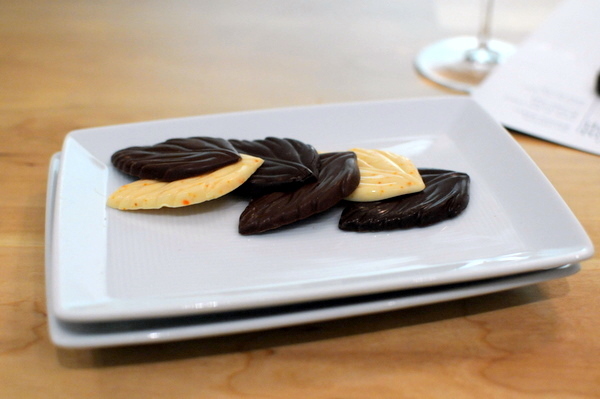 The second plate consisted solely of chocolates: a white with espalette pepper, cafe au lait, and fleur de sel dark chocolate. 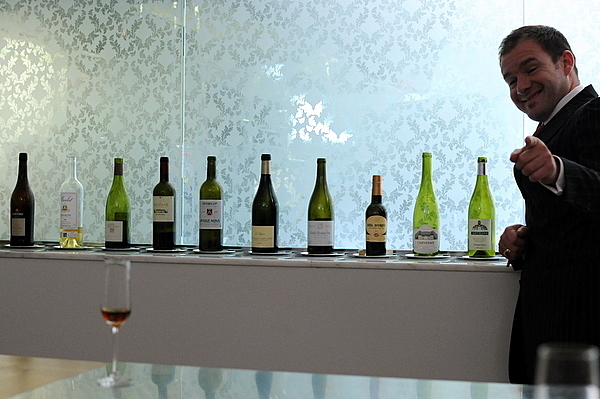 After the meal, Eric lined up the wines we drank in our Bacchanalian excess and he seems justifiably proud of his work. As with previous visits, the meal ended with a visit to the kitchen where Chef Feau greeted us warmly and assured us that by February the restaurant would be even better than what we tasted tonight. 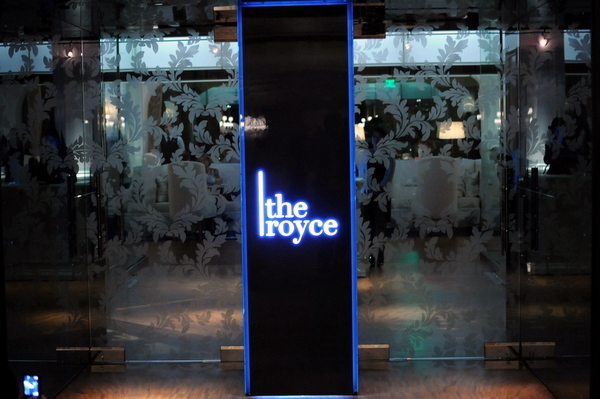 The conscientious service remains unchanged from Voltaggio's day but the real question was whether the food would hold up and in that regard the Royce exceeded my expectations. 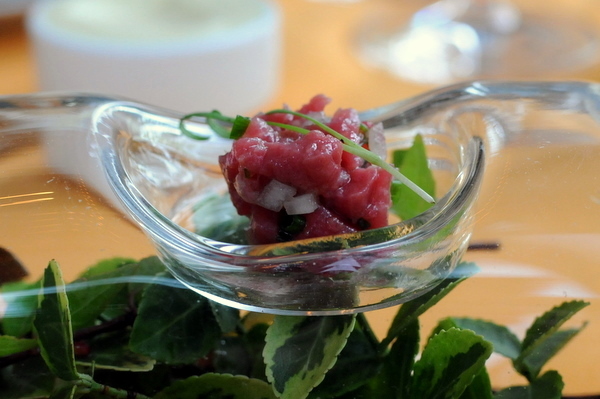 Chef Feau's cuisine is elegant without being staid, adventurous without being inscrutable, and masterfully executed by a kitchen three days old. 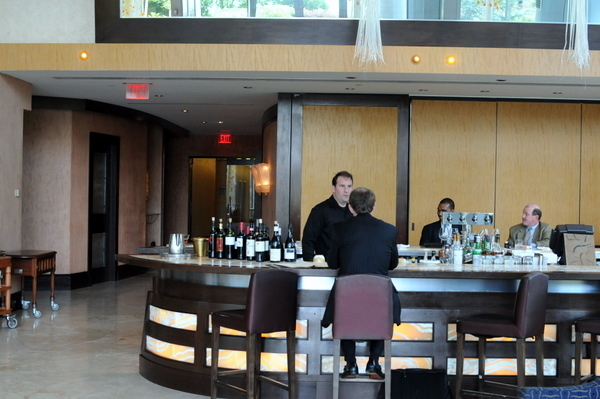 Considering Chef Feau's promise, I am eager to see how the restaurant develops in the coming months. 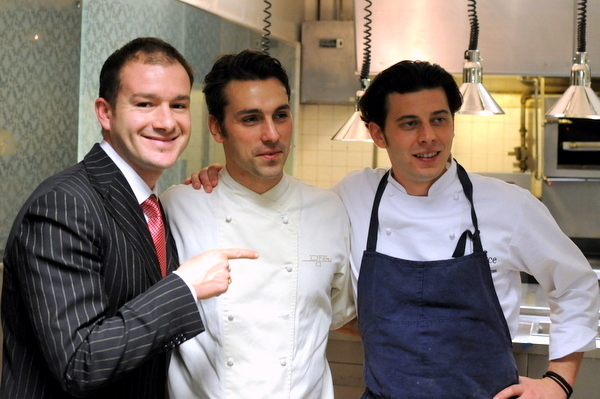 The Bocuse d'Or USA Benefit Dinner is the spiritual successor to the 5x5 dinners of previous years. The format was similar with 5 of LA's most prominent chefs coming together though instead of creating a new dish, they each produced a classic dish made famous by Chef Paul Bocuse. This was fitting considering that the proceeds from the dinner would go to sponsor the chefs chosen to represent the United States in the Bocuse d'Or, the culinary equivalent of the Olympics. 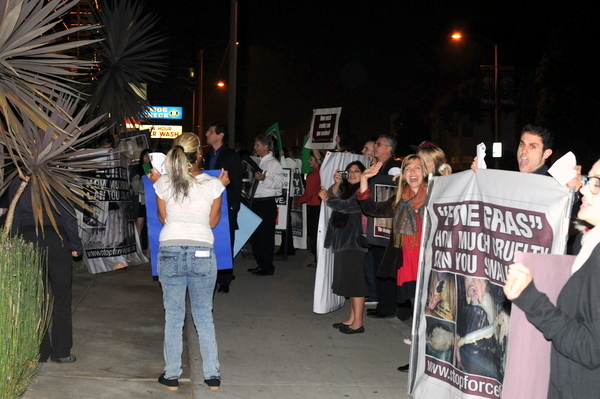 Despite being a charity event, there was a substantial group of animal rights activists gathered outside the restaurant. Perhaps they felt that the prominence of the event would give them a larger forum to share their views. 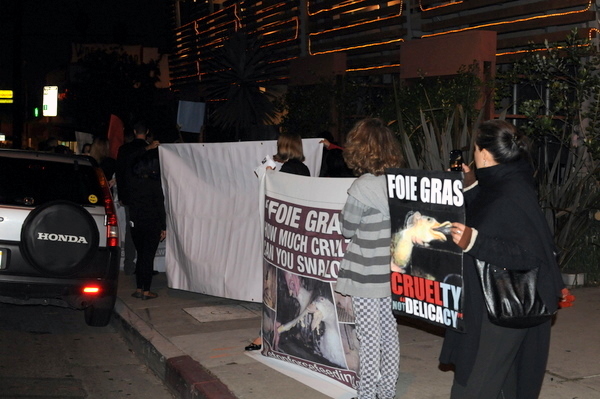 The protesters were decrying the use of gavage used to create the delectable fatty duck liver, foie gras. Still the protesters are entitled to their views and remained relatively well behaved, though they did shout loudly at diners entering and exiting the restaurant. With the ban on foie gras set to take place in 2012 the protesters may very well get their way, though I suspect and hope restaurants will find a loophole that will allow them to keep serving fatty liver. 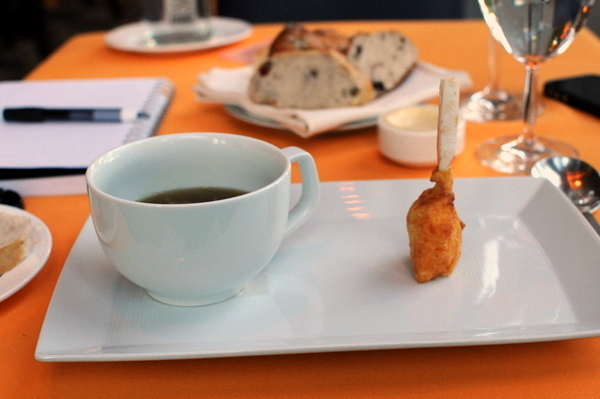 The amuse was made by the host chef just like they were during the 5x5 dinner series. First up was a simple gougere, slightly crisper and more flaky than most, the morsel also possessed a more potent cheesy flavor than the norm. 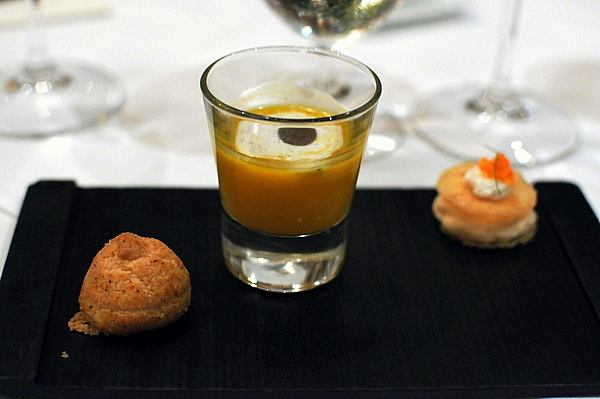 Next up was a pumpkin velouté, completely different from what I was expecting the thick soup featured a pickled tang rather than the typical sweetness. Rounding out the trio was a salmon mousse that featured a slight citrus tinge and light salinity. 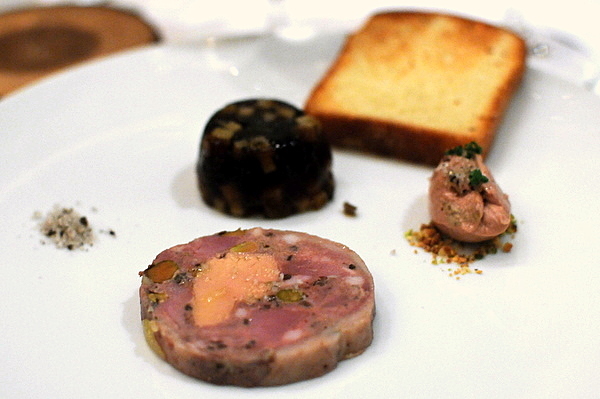 The meal began on a surprisingly heavy note with the first of two courses featuring foie gras. 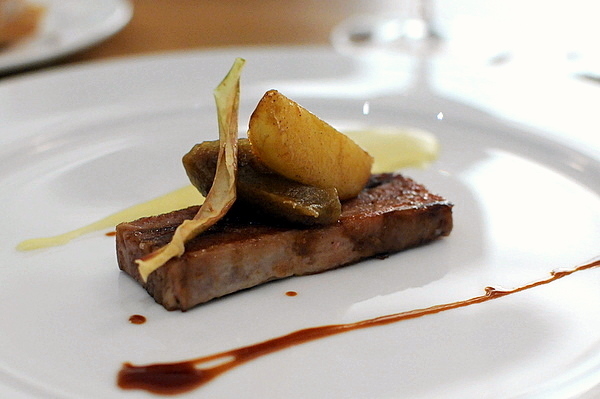 The core of the dish was a delectably savory duck augmented with by the richness of its liver. 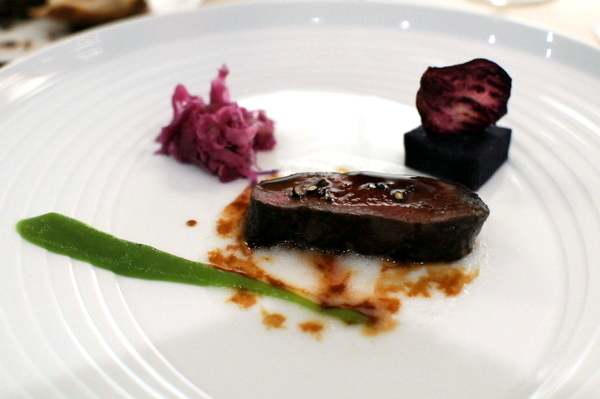 The dish also featured a jelly made from the bird's bone and seeded with celery root that cleansed the palate and a rich soft foie gras mousse. The accompanying gerurztraminer was perfectly suited to the foie, viscous, sweet, and redolent with the flavor of dried stone fruit. crémant de bourgogne, domaine perigot & richard, "blanc de blanc" m.v. 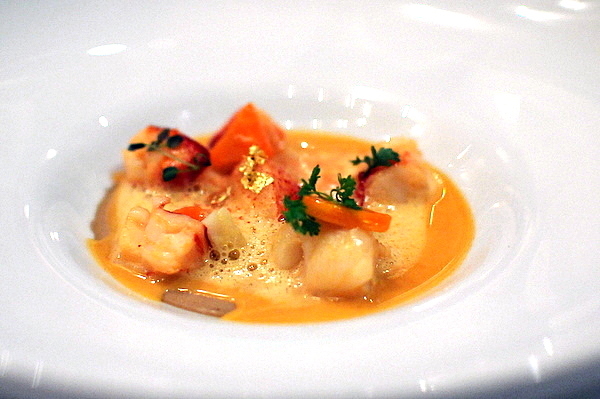 Though not strictly a classic Bocuse dish, the lobster was undoubtedly the best course of the night. The beautifully crisp sweet lobster is augmented by a concentrated sauce made from its own jus as well as a earthy flan of mushrooms. 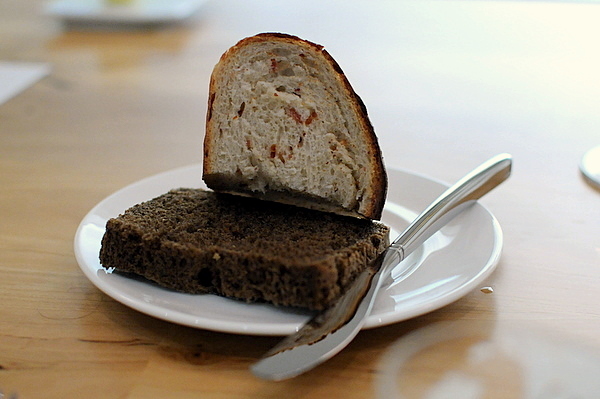 Against this buttery rich flavor, the tang of the tomato and brandy was reduced but not missed. The wine was a crisp ebullient Cremant from Burgundy. 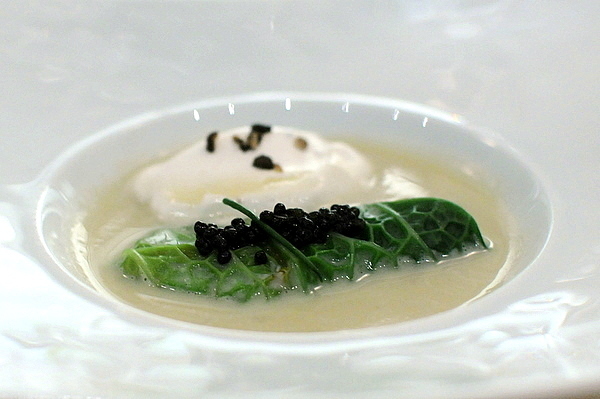 First served at a presidential dinner in 1975, this dish quickly became one of Bocuse's most well known dishes. 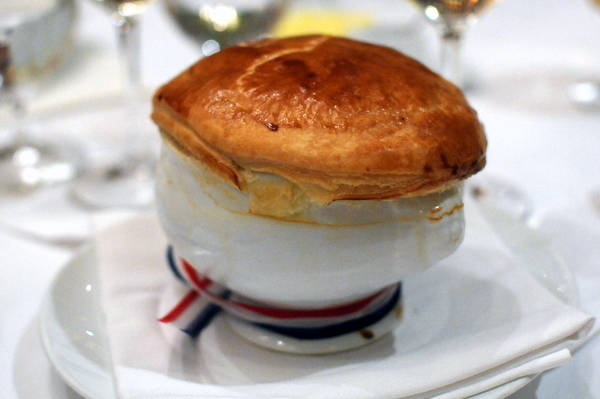 The buttery bouquet of the puff pastry shell immediately reminded us of a pot pie though the soup itself proved to be substantially more subtle. Despite including a generous helping of truffle the complex musk of the prized fungi remained elusive, adding a subdued earthiness. 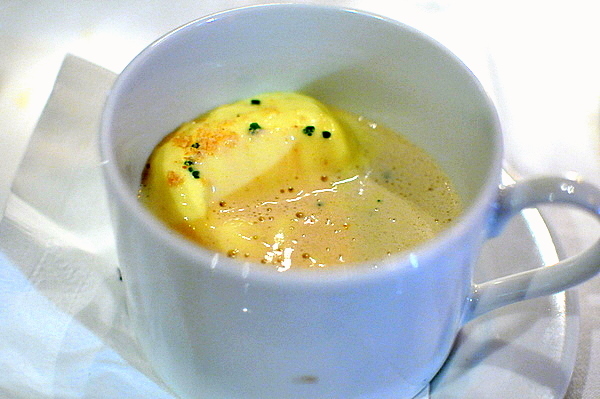 Similarly the foie gras only features tangentially, and the resultant broth prominently features the rustic heft of the capon. The white Burgundy was absolutely fitting, featuring a svelte butteriness and elements of green fruit. Cimarusti demonstrates his faculty for handling fish with this course. 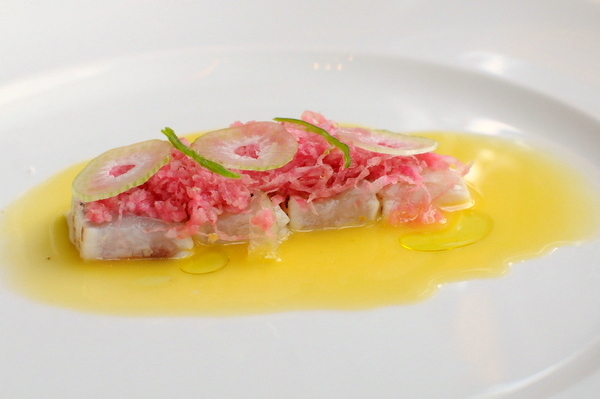 The Rouget is perfectly cooked dense, moist and flavorful. 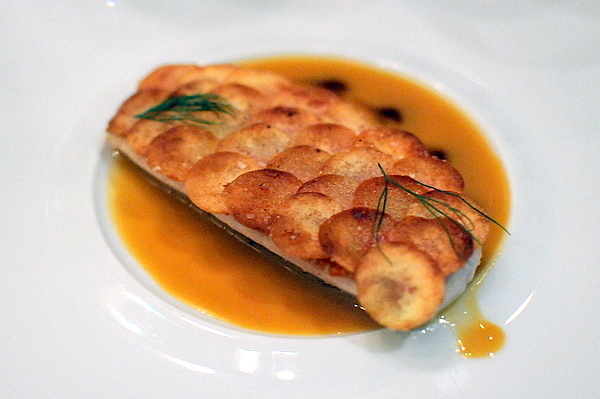 The natural sapor of the fish is hightened by the delightfully salty potato scales and the sweet herbal blend of orange rosemary sauce and veal jus. red Burgundy pairs with the fish, threaded with bright sour cherry the wine was a bit simplistic but enjoyable. 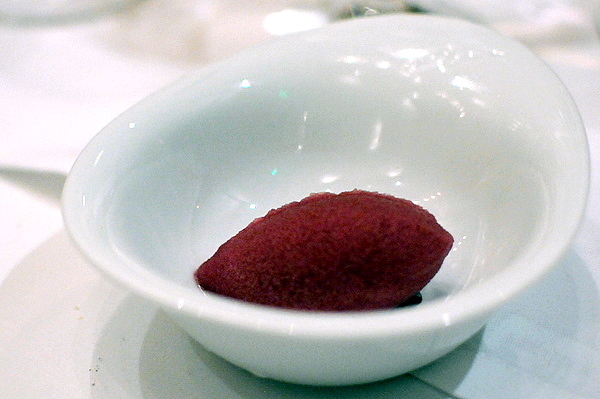 As an intermezzo, we were served this arresting sorbet, the initial flavor of the sweet ripe fruit is quickly followed up by a winey essence and the soft sweetness of the cooked cherries. The entire table agreed that this was one of the best preparation of venison that any of us had ever tasted. The meat was remarkably tender and offered a bold rustic flavor but wasn't overly gamy or irony. Northern Rhone Syrah features both juicy dark fruit and an herbaceous spice linking it seamlessly to the deer. 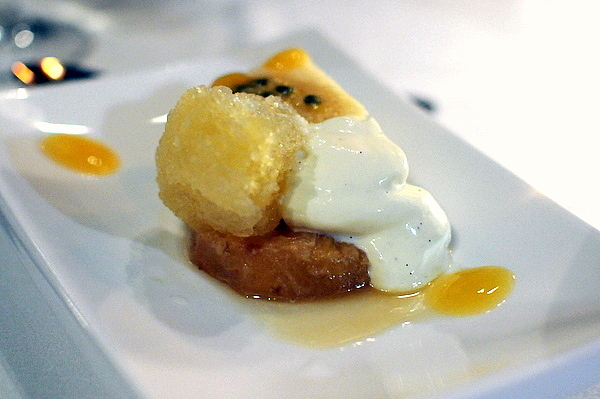 These classic desserts was a far cry from Adrian's normally avant garde desserts but his skilled hand is still evident in the refined flavor of the trio. The simple crêpe was a bit monolithic but the accompanying orange sauce truly spectacular is its vibrancy. 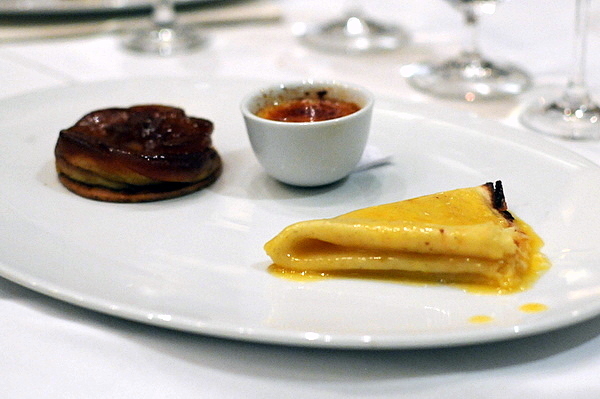 The classic apple tart featured a prominent bitterness that balanced the caramelized sweetness of the cooked fruit. Last up was a simple crème brûlée with all the characteristics of the dessert that had once so enraptured me. 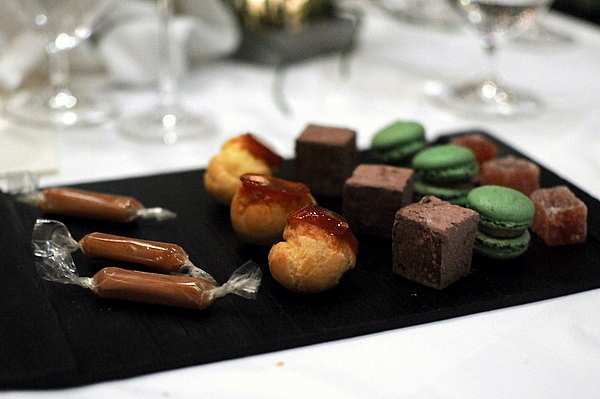 Adrian took a bit more liberty with the mignardises and his skill showed particularly in the ras el hanout pâte de fruits and the cinnamon caramels. 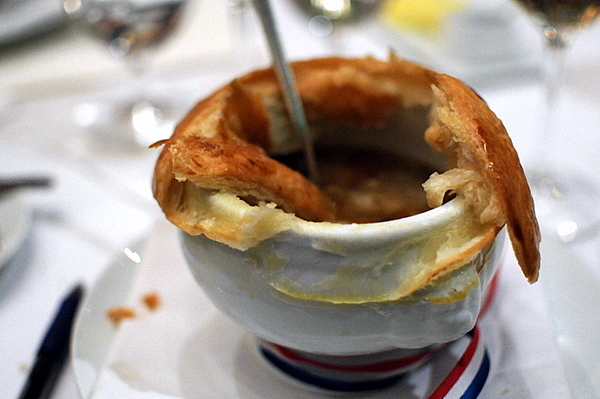 Though the food was a far cry from what one would normally expect from these culinary luminaries, tasting such classic French flavors was refreshing in its own right. As one of my companions noted, with so many prominent chefs cooking this might actually be better than the original.